Roots for the Future: The Landscape and Way Forward on Gender and Climate Change: In recognition and celebration of the tremendous and growing knowledge base on gender and climate change, and the advancements made in integrating gender-responsive approaches to solving the climate crisis, IUCN Global Gender Office is delighted to launch this new expansive publication. 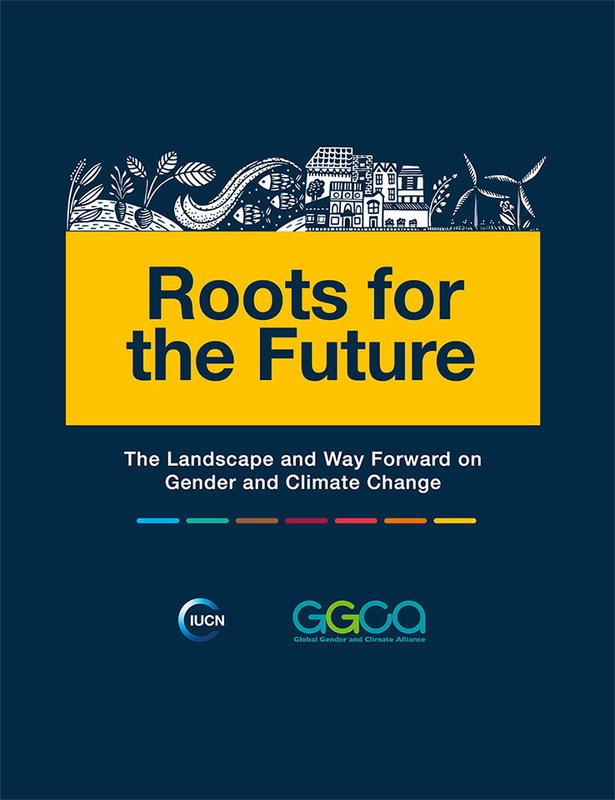 Created for policymakers, programmers, and practitioners at all levels, Roots for the Future is a compilation of the latest information and evidence on gender and climate themes, as well as strategies for ensuring climate change decision-making, policies, and programmes are gender-responsive. Case studies are woven throughout the text, supporting readers to find targeted recommendations to advance the efficacy of their own work. EGI Brief: Gender & Mitigation Actions: Includes key data on gender in mitigation initiatives, a gender assessment of the intended nationally determined contributions (INDCS), and gender trends in nationally appropriate mitigation actions (NAMAS) and low-emission development strategies (LEDS). EGI Factsheet: Gender and Climate Finance: Highlights data on women’s participation in finance decision making, in finance ministries and climate finance mechanisms, and gender policies and action in climate finance mechanisms. EGI Infographic: Gender and R-PPs: Showcases information on gender inclusion in 45 REDD+ Readiness Preparation Proposals (R-PPs). EGI Factsheet: Women in Environmental Decision Making: A global dataset comprised of nine indicators that cover diverse facets of the environmental arena, including international climate change policy; climate finance; and the forestry, energy, and transportation sectors. EGI Brief: Gender Focal Points and Policies in National Environmental Ministries: This dataset assesses how gender considerations are being included in environmental sector ministries, resulting from an EGI survey of ministry officials and other experts. We hope you find these new knowledge products useful. We welcome your feedback—please contact us here.